This mosaic was made within two hours. 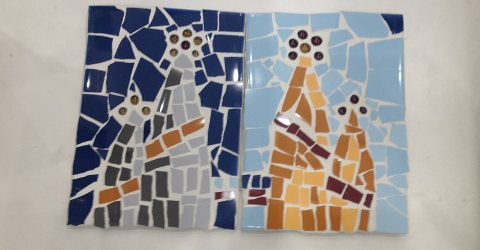 Learn the mosaic method "Trencadis" (mosaic of broken tile shards) invented by Antonio Gaudí and create your own ceramic and Tiffany glass artwork. These mosaic classes have no limits on your creativity and imagination. Young and old, male and female participants are equally enthusiastic during this class, especially for families it is great fun. And on top of that you can take your own, very individual souvenir home. For more elaborate decoration objects, such as salamanders, higher material costs and longer duration of the class are needed. If required, this service will be charged additionally with € 5 locally. After completing your mosaic artwork, it has to dry and needs to be grouted by MOSAICCOS (except 8 hour class). You can pick up your mosaic works the next business day. The booking is really easy: Enter the number of persons that you would like to book the workshop for on the right side, select the desired date and click on "Add to cart". Within 48 hours after booking you will receive a booking confirmation along with detailed directions to the art studio. Please note that your art work need to get grouted and can only be picked up in the morning of the following day. The classes take place in the district El Borne in c/Assaonadors. The venue is located about 3 minutes by foot from Picasso Museum. Free cancellation up to 48 hours prior to the booked event. No cancellation fees, you will receive a full refund. In case of a later cancellation or a no show a refund won't be possible. You can cancel via e-mail stating your booking number. You design and create for example a picture or mirror frame, photo frame, coaster, elephant or a design of your own choice like for example a soccer emblem. The best part about it is that you leave the workshop and have made a unique souvenir all by yourself. You will learn cutting with the mosaic pincers and creating your own Trencadis mosaic masterpiece. Several decoration objects are available at choice like for example a photo frame or elephant. Just like the 2 hours class, but larger objects. You will learn cutting with the mosaic pincers and creating your own Trencadis mosaic masterpiece. Several decoration objects are available at choice like for example a photo frame or elephant. Introduction to the different techniques and materials. Each participant chooses his own design (motive) and creates his own mosaic masterpiece. Patterns are available, however you are welcome to bring your own pattern. All necessary materials (glass moraic, ceramic tiles etc. and object slides) and tools are provided. No prior knowlegde is necessary. You will create your objects in the direct technique. In the end of the workshop you will be able to work in this creative art on your own at home. In Barcelona, you will often come across the works of Antoni Gaudí, who has often used and perfected the Trencadis - the technique of creating images with broken ceramics. It is much easier to get involved with his works and to understand them, if you have used his technique with your own hands. The result of the class is always a unique souvenir that you can admire for a long time after your trip to Barcelona. It does not require the genius of a Gaudí to produce something beautiful. And if the planned salamanderis actually becoming a whale, it is still your unique work. You will have a lot of fun during the Trenkadis class, especially if you are attending the class with your family or in a group.